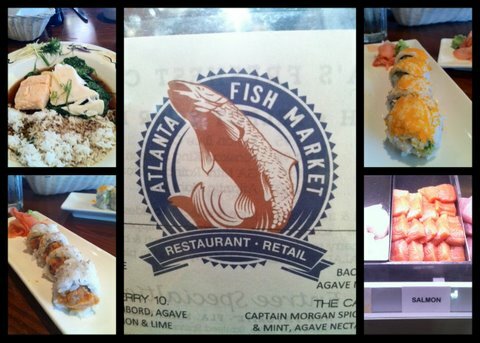 I went to Atlanta Fish Market with some business associates. I cannot remember how many times I have passed this place and did not even pay attention to its location. This is despite the fact there is a giant fish statue in front of the building. Sometimes I can be oblivious to my surroundings. Good thing we made reservations because the place was packed. For an appetizer we ordered sushi. Everything was really good. The flavors were light and fresh. For my main course, I chose my fish and the style of cooking. Of the many different varieties, I ordered salmon and another white fish. I decided to go with Hong Kong style. On paper this sounds awesomely delicious. But the reality was not as spectacular. I thought it would be pan fried with Asian spices, but it was essentially boiled fish. I am not a big fan of boiled fish. The flavor was good but the texture was not my preferred method of eating fish. In retrospect, I should have ordered sautéed or blackened for the cooking method. I cannot really rate the restaurant poorly for the fish entrée because they gave me exactly what I ordered. I know for next time to ask more questions to determine how the fish is cooked. On the upside, the sushi was the best I have had on the east coast. I do not usually order sushi unless I am on the west coast because I know how far the fish has to travel before getting to my plate. In the case of Atlanta Fish Market, they have planes flying in their fish fresh every day. I know I should feel bad about my carbon footprint this whole equation, but it was so decadently tasty.